England 5-195 (Alex Hales 94, Michael Lumb 43, Fawad Ahmed 3-25) beat Australia 9-168 (David Warner 53, Glenn Maxwell 27, Jade Dernbach 3-23, Danny Briggs 2-25) by 27 runs. The hosts powered 195 runs with half of their side back in the pavilion at the end of the scheduled 20 overs and the visitors reached 168 after losing nine wickets. Alex Hales (England) was declared ‘Player of the match’ for his blistering knock of 94 runs off 61 mere balls. The second and final T20 of the series was played on Saturday, August 31, 2013, at Riverside Ground, Chester-le-Street. Earlier, George Bailey won the toss for the Kangaroos and decided to chase. Michael Lumb along with Alex Hales went into bat and hit two fours each in the first three overs. Hales punished James Faulkner for 19 runs two overs later with 1 six and 3 fours and they added another 15 in the sixth over with 3 boundaries. Hales was the most aggressive of the two, he attained his sixth T20 fifty in the 10th over and the pair accumulated another 16 runs in the next one with 1 six and a couple of fours. The first wicket fell at 111 when Michael Lumb was caught behind by Matthew Wade off Fawad Ahmed for 43 from just 27 balls with 1 six and 6 fours. Luke Wright was the next batsman in who hit 1 six and 3 fours in the coming overs but was gone for 30 and was replaced by Eoin Morgan. 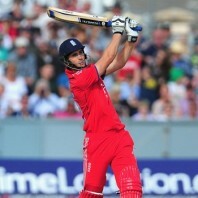 Alex Hales became the next victim at 187 in 19 overs for 94 off 61 deliveries comprising 2 lofty sixes and 11 fours. Eoin Morgan scored 20 as the home side piled up 195 for the loss of five wickets in 20 overs. Fawad Ahmed was the top wicket taker with three whereas James Faulkner held two. The Kangaroos lost two quick wickets for just 15 runs that included the important dismissals of Aaron finch and Shane Watson for 5 and 7 runs respectively. Shaun Marsh joined in with the opener, David Warner, who hit 2 sixes and even fours until the sixth over and got another 14 in the next one with 1 six and 2 fours. Marsh was clean bowled by Joe Root for 13 and the new batsman, George Bailey, scored 12 runs in the 11th over with 1 six and 1 four. David Warner achieved his 10th T20 half century but lost his wicket for 53 off 42 with 3 high sixes and 5 fours. George Bailey was declared leg before wicket off Danny Briggs for 23 when the rival bowlers took charge. Glenn Maxwell was the other lone fighter as the wickets kept on crumbling at the other end regularly. Maxwell surrendered after scoring 27 off 16 balls with 1 six and 2 fours and the Aussies squad managed 168 with one wicket remaining after the last ball of the 20th over was bowled. Jade Dernbach was the most impressive bowler with three wickets, Danny Briggs got two whereas Steven Finn, Stuart Broad and Joe Root shared one wicket each. England triumphed in the second Twenty20 by a margin of 27 runs and the two game series concluded at a 1-1 draw.